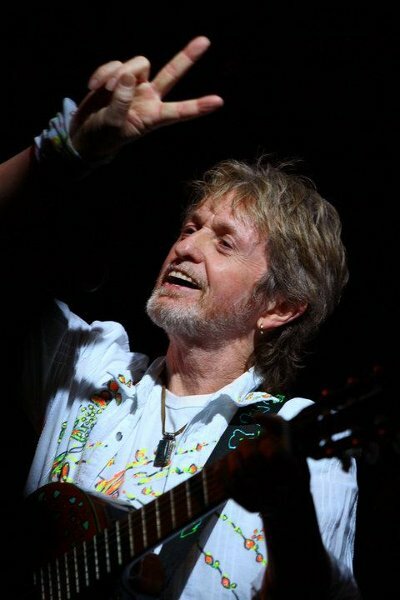 Yes frontman Jon Anderson is a happy man these days. First off, his wife, Janee, has beaten cancer. Then there is Yes with Anderson, Rick Wakeman and Trevor Rabin (not to be confused with the other version of the band with Steve Howe, Alan White and Geoff Downes) which has been touring playing the music of the band for the last two years. Finally, there is an Anderson solo album, one that he says he started twenty-seven years ago. While he is holding the story of the long delay for the album notes, he has said that the album will be called "1,000 Hands" in a salute to all the people who have participated in its recording, then and now. Why did it take so many years?, well there is a crazy funny story that I will tell in the liner notes of the album, the album will be called '1,000 Hands'...simply because of all the wonderful musicians and singers who performed on it...I hope to have it ready this Spring 'fingers crossed'..
As for YES, we are dreaming big all the time, so happy with the concerts we have done around the world over the past two years, and the next couple of years we hope to eclipse everything we have ever done, 'dreaming big' as usual..
What a load of rubbish. There is no other version of Yes. Yes is official. It has more than three members - Steve Howe, Alan White, Geoff Downes, Jon Davison, Billy Sherwood in its lineup. There is a band calling themselves Yes Featuring Jon Anderson, Trevor Rabin, Rick Wakeman. Maybe that's where the confusion lies for you with ARW having 3 members in its band name. But again - there is one Yes. They get to call themselves that. ARW CAN'T call themselves that. You may not be aware but ARW is actually touring now as Yes Featuring Jon Anderson, Trevor Rabin and Rick Wakeman. They have retired the ARW name and have said that it is their right to use the Yes name. Jon is the spiritual heart of Yes and to me there is simply no Yes without him. It's a bit like saying you are Led Zeppelin and playing without Robert Plant. Yes featuring ARW are excellent. Jon Anderson is Yes and always has been.